I must say that I was looking forward to The Test of the Century immensely. As an eleven-year-old at the time, I remember the match vividly even if, like the England tour of India during the same winter which preceded this famous Test, I had to rely on newspaper reports a day or two after the Tests to find out the scores and result. As is well-known, the 1977 Centenary Test was arranged to celebrate the first Test one hundred years previously. Also played at Melbourne, the celebratory match took place during the same week of the original Test and very likely turned the corner for media coverage of Tests. It is odd, though, to think that the 1877 participants were unaware of their match’s status at the time the game was played. 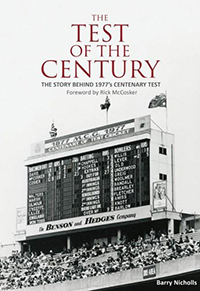 There are other books on the 1977 Centenary Test but it is nice to read this further one just shy of the match’s fortieth anniversary. It certainly doesn’t seem that long ago to me and Barry Nicholls leads into the grand occasion of the match neatly with a nice history of Anglo-Australian – whoops, should I, bearing in mind that this is an Australian publication written by an Australian author, reverse that even if I’m not sure how to put it? – Test cricket. The lead-up to the Test, the prior England tour of India and all the players from both sides are all discussed with many of the players involved interviewed and I found myself quite gripped by it waiting for the match to start. Each day – and, let’s not forget, a rest day – come under their own chapter with end-of-day thoughts from some of the leading players. In a way, though, I would have loved to have learnt more. I found Barry’s efforts in many ways excellent but there were times when I would have loved to have read and found out a bit more. I rather wished that the last five England wickets to fall thus deciding the match in Australia’s favour by the same margin had taken rather longer than just over one page to fill. Barry has been a little let down by proofreading but, for all that, I thoroughly in the main enjoyed The Test of the Century. Where this book should score is that, being written so many years after the event, it may be unknown that players from both sides were being scouted to join Kerry Packer’s World Series Cricket. As Barry notes throughout the book, Australian cricketers in particular represented their country for love and honour first and still had to find ways to earn a living. It seems remarkable but this Test, possibly unwittingly, proved to be the changing of the times. One wonders how galling it must have been for the players providing an unforgettable spectacle to see all the lavish celebrations and money spent on flying former cricketers from England and yet be poorly remunerated for their efforts. Sadly, four of the players are no longer alive but Barry Nicholls again lets the reader know what the others are doing and makes it a book very well worth having. I must thank Barry for rekindling the interest of those heady days almost forty years ago and, sadly finding no television coverage of the Centenary Test on Amazon, I was delighted to find someone’s efforts on YouTube so thanks to Barry for bringing this most famous of Tests back to life.